We've heard stories about how Nintendo started as a playing card company, and dabbled in other things. This handy graphic lets us see when their transformation took place, along with other popular companies. 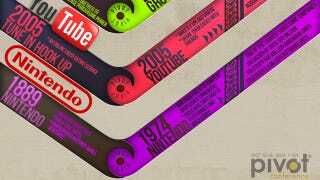 What were Nintendo, YouTube and PayPal doing before they transformed themselves from humble beginnings into what we know today? Check out the full graphic below.